A proud YouTube moment! 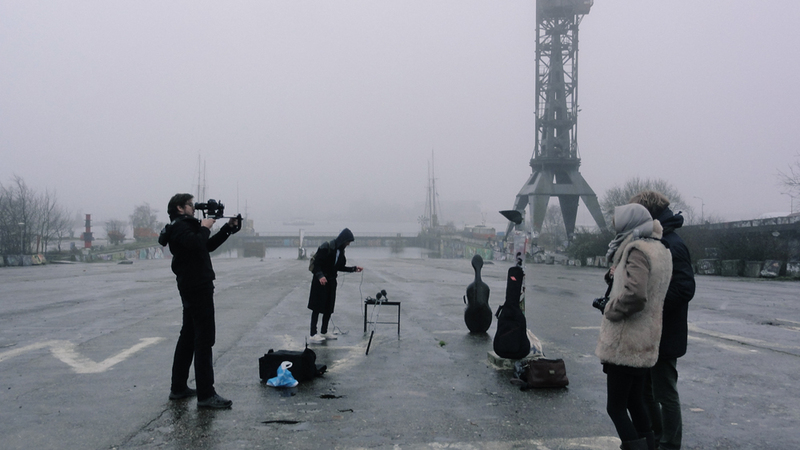 Such a beautiful film shot for the live acoustic video concept Amsterdam Acoustics at Amsterdam NDSM-werf and a beautiful song composed by Olivier Heim (aka Anthony Chorale). The cello part was composed by Karolina Rec and of course performed by me, Janice Wong. Below is part 2 of my performance with Anthony Chorale (real name Olivier Heim) for film project Amsterdam Acoustics. It was pretty crazy. We only met and rehearsed the night before because Olivier was only passing through Amsterdam over the weekend. The moody grey sky was the perfect state to record at the NDSM-werf (an area in North Amsterdam) except the rain was coming and going. In the end we did this video in one take and as the rain got heavier each note we kept playing I closed my eyes in pain thinking about the rain dripping down the front of my cello and only hoping that the take would be good enough. I’m so glad this footage has seen the light of day. This was today on set for Amsterdam Acoustics. They make one-shot artistic acoustic music videos of musicians in Amsterdam, in the style of La Blogotheque/Take Away Shows. After a successful first season and 64 videos later, founders Jeroen van der Poel and Arttu Sesselaar have finally decided to continue the project with more focus and in depth footage/interviews with the artist. They contacted me to be part of the first video of season two.